If you want to learn stage lighting, there are many different ways do it. Learning lighting theory, technical equipment and lighting design can be hard enough but with a vast amount of technical terms and jargon too, stage lighting can seem pretty hard to get into. On Stage Lighting takes a look at some of the options available to help you learn stage lighting, all of which we have done too! Reading books on stage lighting (including informationon the internet) , whether about lighting design or equipment and practices, can really help you to understand the subject. Books on technical theatre, as well as lighting , can consolidate information that you have picked up as well as provide easy references to stage lighting terms and the structure of putting on an event or show. Although you cannot learn an entire subject like stage lighting just by reading a book or two, books are still a great way for beginners in lighting to “mug up” on jargon while considering some of the more theoretical and scientific aspects. You might be interested in reading Books On Stage Lighting – 5 Of The Best for further information. Thanks to O2ma for this great picture! There are many short stage lighting courses and workshops available to help you learn the practical skills such as rigging and cabling stage lights. These lighting courses often take place in a theatre or venue and are open to anyone who wishes to take part for on or two days, usually for a small fee. When starting to learn stage lighting, it can be helpful to meet others at your own level of experience and get the opportunity to use some equipment that may not be available to you. Short stage lighting courses and workshops often use lighting industry professionals as tutors and it can be great to be able to ask them questions while trying your hand at learning new lighting skills. Update:// As well as lecturing, I also offer short courses on stage lighting to clubs and individuals. Click for more details. During the last 10 years there has been a steady growth in University courses for the performing arts and the live event industry. While many of these cater for a broad range of topics, many more courses are available to aspiring theatre technicians, lighting designers and other technical specialists. Drama schools, which used to be the only place to run recognised courses to learn stage lighting, have also changed to keep pace with the expanding market. Such courses enable you to grow your existing knowledge of stage lighting and give you the chance to make mistakes and take on more responsibility in you chosen field. They also often have ties with the event industry that lead to good work experience placements and job offers. Note: I am currently Senior Lecturer at Bath Spa University on such a course, a popular BA (Hons) in Theatre Production and a Fellow of the Higher Education Academy. 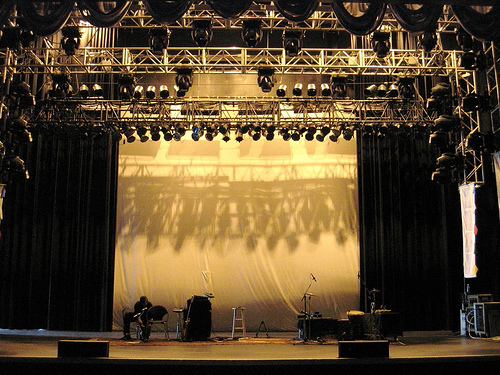 In recent years, work experience has become a tricky subject for many stage lighting businesses. The increased demand for places, plus a greater awareness their legal responsibilities, mean that some lighting companies are less willing/able to take on young people who wish to learn stage lighting. That should not stop you from trying to get a work experience placement with a good lighting or theatre company as there is no substitute for practical experience with professional lighting engineers. Developing your stage lighting skills by volunteering can range from helping at your local church, university productions or even going along to your local theatre company and helping out – for free. When your stage lighting experience is limited, volunteering can be a great way to get to work in a professional environment and learning from the experts. When you have a good level of skill, a professional company should start to pay you. Volunteering not only helps you to learn stage lighting, it also gives you some good experience for your CV. There is plenty to be gained from building relationships with people that know what they are doing when it comes to stage lighting. Learning from others that have done it. Ideally, you should also learn from people who have spent 20+ years in professional stage lighting design and programming AND have a professional teaching qualification and significant mentoring experience. Luckily, we have that covered here at On Stage Lighting. Check out http://learn.onstagelighting.co.uk to find out more. Because stage lighting is an essentially practical subject (rigging, focussing and operating) there is absolutely no substitute for practical experience. Learning stage lighting is easier when you are doing it, preferably with other people who really know their stuff. Everyone who gets into stage lighting has to start somewhere, and most lighting professionals can remember exactly who helped them learn and develop their skills in those early days. This means that they are usually willing to help you by passing on wisdom and practical skills and accept your mistakes. Everyone who has ever learned stage lighting skills did so because they found it an engaging and interesting subject. If you want to learn stage lighting, get a book, get a gig, get around. Simple as that. And make sure your check out our Learn Stage Lighting Category! At a basic level.. Phosphene runs occasional one day courses for raw beginners (next one in March 2009) and the site offers a free advice service which draws on full time experience dating back to the beginning of the 1970s. please hw cn i get into stage lightin course around southeast london area thanx..
Hi, im looking for an “experience day” or a one day training course as a present to my partner who’s hobby is DMX lighting. He is knowledgable about DMX and especially programming c/c++ (is very good at it) but has no hands on experience of stage lighting. Any suggestions? I was just wondering if anyone has any experience of the ABTT training courses. Im considering putting myself through the courses as part of my ambition to move into lighting full time. Im mostly interested in the electrician courses but any information would be helpful. Hi Callum, I don’t have any experience of the ABTT Electrican Training courses but the content looks worthwhile and the ABTT are a reputable organisation. If you do decide to attend one their courses, post back here and let us know how you got on. In spite of having have no training I produce shows every year with very limited lighting. We have parcans from the front and sides of a wide open stage. I want to do a silhouette number but don’t know how to do the lighting. Can you advise me please? You’re trying to get the background bright… and the cast in the dark. There’s two parts to this. One is more scenic than LX, in that you really need a light (?white) backing such as a cyc lit really brightly. The LX aspect is that you need the source of the light for the cyc to be upstage of the performers. From what you say I suspect that someone has given you side booms of Pars on the downstage edge of your space. Can you shift them upstage for this job? Cheats method, and slightly dependent on exactly why you want a silhouette, is to use just your side-light, angled as far downstage as the audience can tolerate, to give you some sort of crude backlight, though backlight is very different from silhouette! Off topic slightly, I see this site is still saying our next lighting course here at Phosphene is in 2009… naturally it isn’t and will be in autumn of this year 2010. You want to do a silhouette effect, I agree wth C.Dix a bright cyc with little or nothing else. If you want chinese shadow effect which is a silhouette projected onto a screen between audience and actor, then the actor will need to be backlit with a hard light. I have used an Arri Studio 2KW Fresnel but with the lens door open. You could even see the detail of the actors beard. The lamp is easily placed behind the actor on the floor making the actor larger than life, moving the actor to the screen the silhouette gets smaller and moving to the lamp the silhouette effect gets bigger. My job is to look after the stage and hydraulic and maintainace of the hydraulic . can anybody direct me to the right path. thank you. i am intersted in learning lights for stage or events and space as well ( currently working as architect). what first step you suggest? Summer school available? I am in Austria but could move during the summer..
No courses planned in Nigeria at the moment unfortunately. Thanks for sharing all your knowledge all these days which has been useful for a budding designer like me. I’m 25 and running my dad’s sound & light company for past 5 years. I learned lighting design practically and through some professionals. But I want to learnt it theoretically and also I hardly find any bigger gigs here in Chennai, India. So I wanted to learnt it some where. Whether such courses available in Singapore? Pls help me out. I have been working in event productions since 2 years now and I have started learning a lighting design through designers who come down here in Dubai for gigs and see them how they work so I started off with Grand Ma 1 on PC in combination with Grand MA 3D. but still I am looking ahead for certified courses so that I can master this profession as a full time Lighting Designer. Thank for ur reply last week,but am into the practical experience already,but there is no standard lighting company in nigeria,what can i do,pls help.